The allegations surrounding President Moon Jae-in’s daughter Moon Da-hye may be expanding into yet another scandal that bogs down the ruling and opposition blocs. Earlier this week, Rep. Kwak Sang-do of the main opposition Liberty Korea Party called on Cheong Wa Dae to reveal why the president’s daughter moved abroad, speculating that Moon Da-hye’s family left the country to avoid legal issues. Using the real estate and school records of Moon Da-hye and her son, Kwak revealed that the president’s daughter and her family moved to a Southeast Asian country last year. 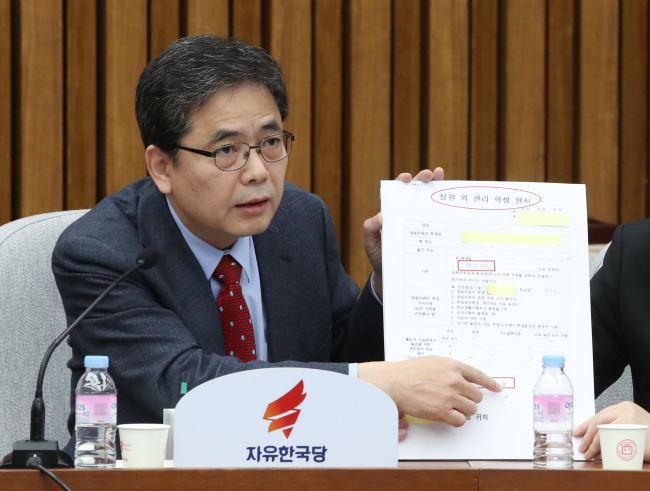 The documents secured by Kwak show that Moon Da-hye’s husband gave her ownership of their residential property in April 2018. The property was sold to a third party in July, after which the family moved out of Korea. Citing rumors of Moon Da-hye’s husband being involved in illegal actions, Kwak called on the presidential office to reveal the reason behind her family’s moving abroad. According to Kwak, rumors are circulating that Moon Da-hye’s husband, identified by the surname Seo, was involved in embezzlement and misuse of 3 billion won ($2.7 million) of a 20 billion won government subsidy his employer received. The rumor cited by Kwak also claims that Seo sold his home and moved abroad to avoid his assets being seized. Kwak has since shifted the focus of his claims to the cost of protecting Moon Da-hye’s family abroad, and claimed that there was public outrage at the president’s grandson attending an international school. “The entire family of a president’s daughter moving abroad during (a president’s) term is unprecedented, and (the president’s) grandson attending an overseas international school that charges tens of millions of won in tuition fees is enraging parents,” Kwak said at a press conference Wednesday. Cheong Wa Dae has responded to the allegations raised by Kwak with accusations of its own, claiming that Kwak was spreading “groundless, malign false information” about the president’s family. Cheong Wa Dae spokesman Kim Eui-kyeom on Tuesday, also said that there may be irregularities in the method Kwak used to gain related information, and that legal measures will be taken if any illegal elements are found. Since the allegations were raised, suspicions have risen that Kwak had intended to gain information specifically on Moon’s grandson in requesting information from the Seoul education office. According to Seoul’s education office, on Dec. 27 Kwak requested changes in students of the elementary school Moon’s grandson had attended. The school gave the list of about 100 students who had transferred in the relevant period, and on Dec. 31, Kwak requested information on students who moved abroad. In the second request, Kwak asked for the country and city the students moved to, and the school they transferred to. Kwak then asked the school to provide information on students whose transfer papers were submitted after July 11, 2018, when Moon Da-hye sold her property. While the process and the requests are within Kwak’s rights as a member of the parliamentary education committee, a National Assembly member requesting such information from a specific school outside his constituency is said to be highly unusual, raising suspicions that he may have been specifically seeking information on Moon Da-hye’s family. Chung Doo-un, a former conservative lawmaker, on Thursday claimed that Kwak appears to have multiple motives for raising the allegations. Speaking on local radio, Chung said that Kwak’s allegations are aimed at gaining media attention for himself ahead of next year’s general elections, and an attack on Cho Kuk, the senior civil affairs secretary to the president. The main opposition has long called for Cho’s resignation in connection with another scandal surrounding a former prosecutors’ office investigator who had been part of Cheong Wa Dae’s special inspections team.